The chalet Agathe Blanche, located minutes from the center of Courchevel Moriond is a ski-in ski-out chalet built on a nature trail and decorated in the purest spirit of Savoyard traditions. 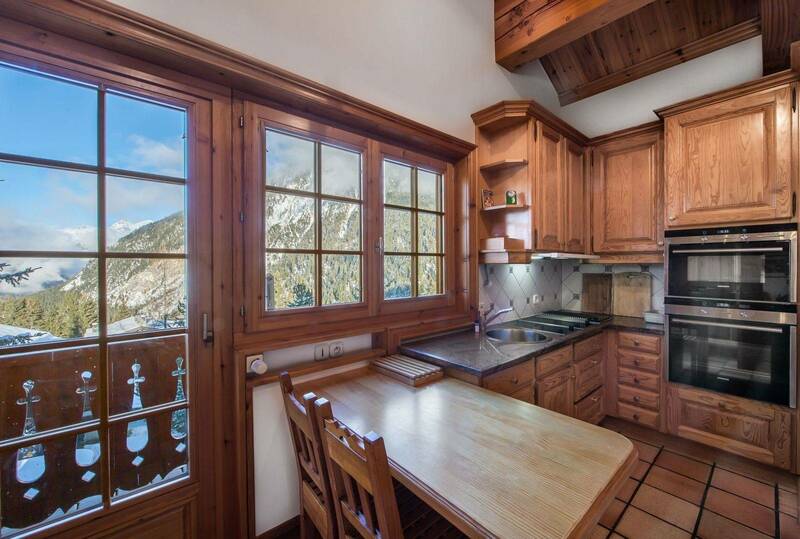 This chalet on the piste and is one of the few authentic wooden chalets in Courchevel 1650. 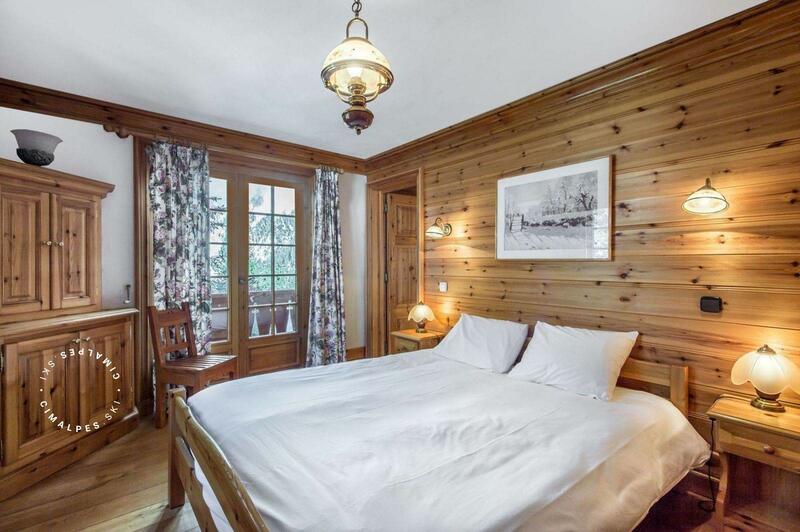 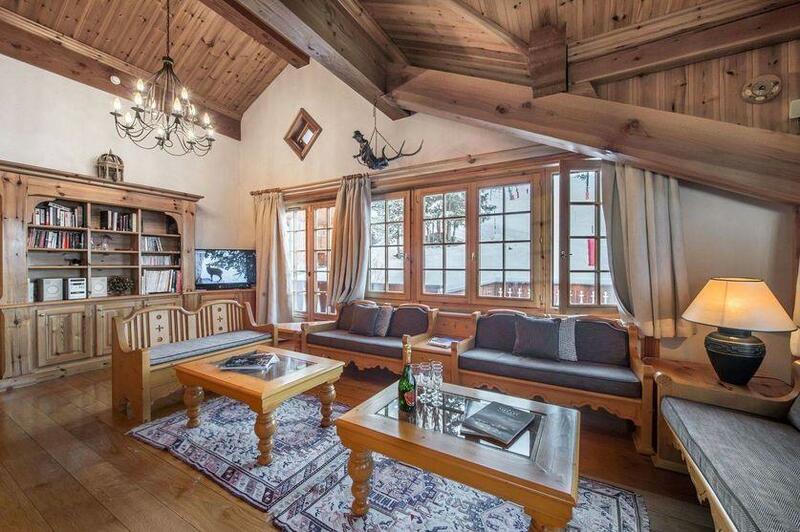 The interior decor of this ski-in ski-out chalet is in typical Savoyard style. Old wood decorates the floors, walls and ceilings and the light enters the chalet naturally by large glazed openings from this sublime mountain setting. 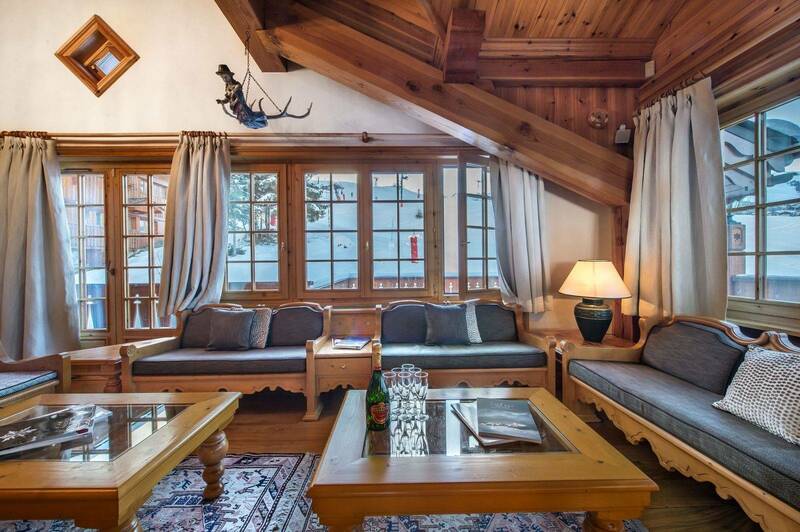 In the wide and bright living room under high wooden beams, we sit on large grey sofas to share a long well deserved apetizer with family or friends after the long day of skiing on the 600 kms of slopes in the 3 Vallées. The reading area itself is home to two comfortable red chairs, facing the large stone fireplace of mixed wood and copper. 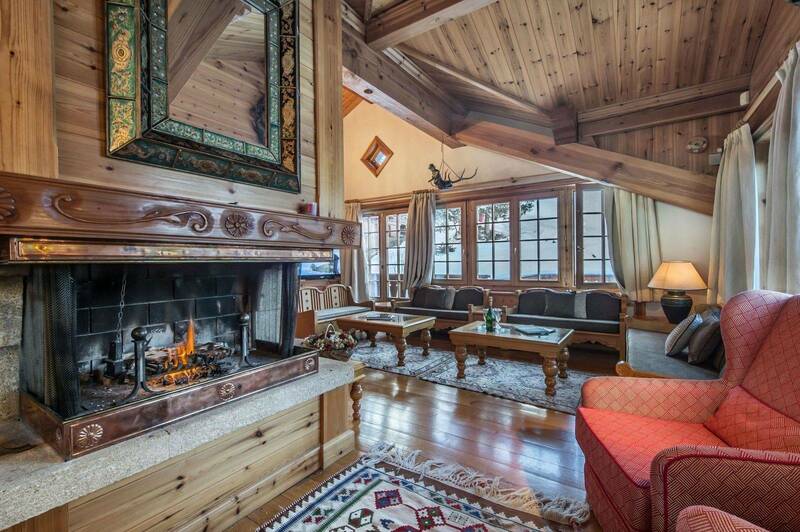 This area is conducive to a relaxing moment, while absorbed in reading the novel in which only the crackling of wood in the fire will distract you. 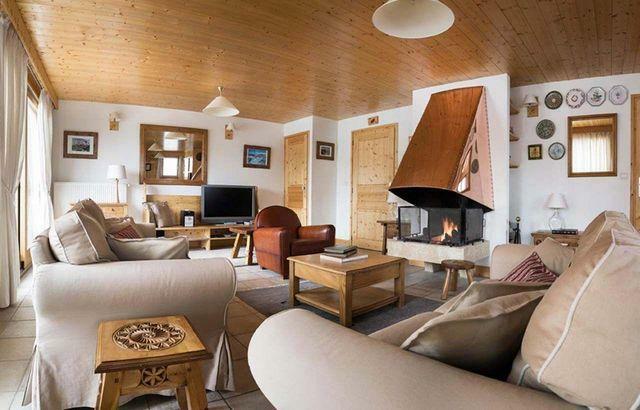 Enjoy the spacious living areas and the many facilities offered by the chalet Agathe Blanche. 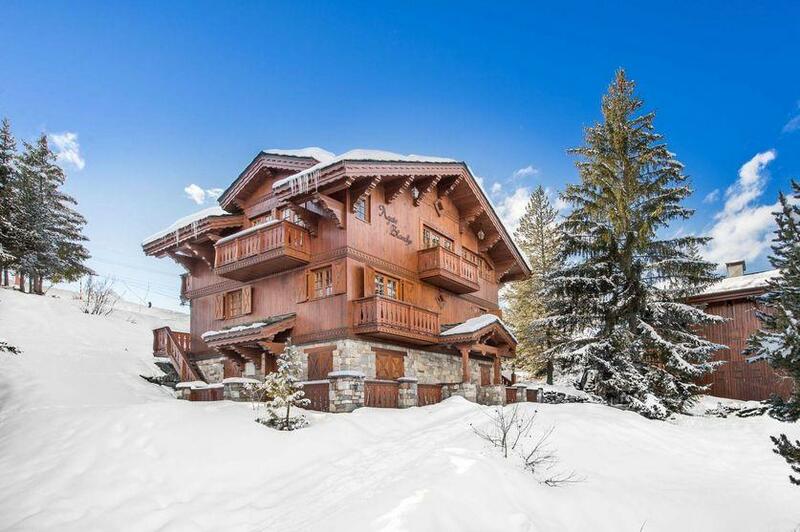 This ski-in / ski-out chalet is on the piste and offers modern comfort for ten people in its five en-suite bedrooms. 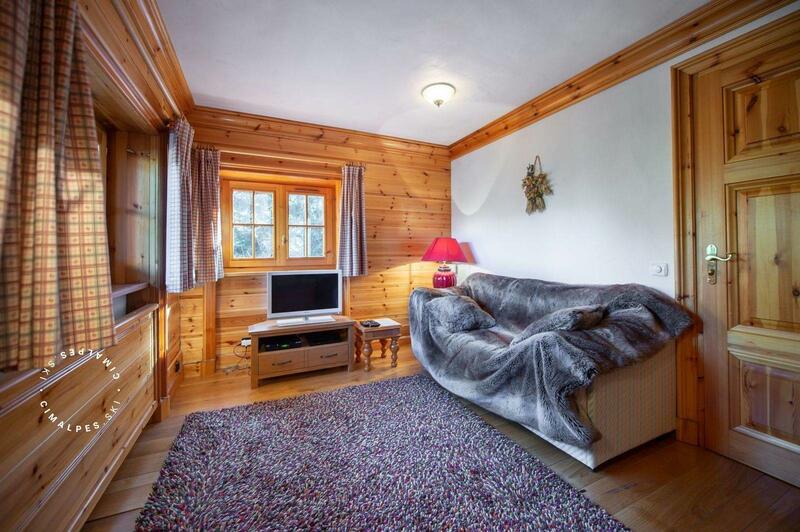 The lower level of the chalet has a private ski room from which you’ll be the first on the slopes, a relaxation area and play area for children with TV and sauna. 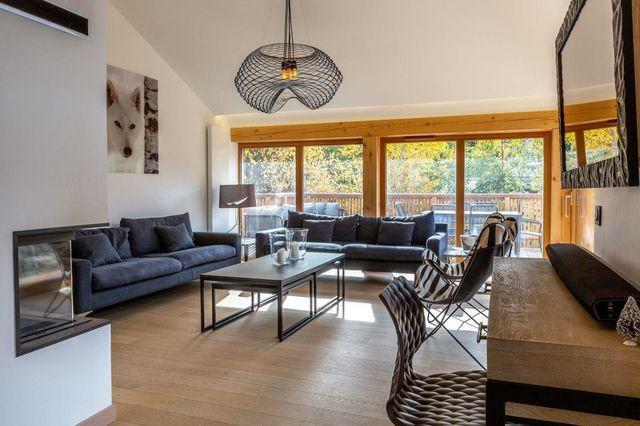 On the first level of the chalet, you will love the large terrace facing south offering unique views of the Courchevel skiing area. 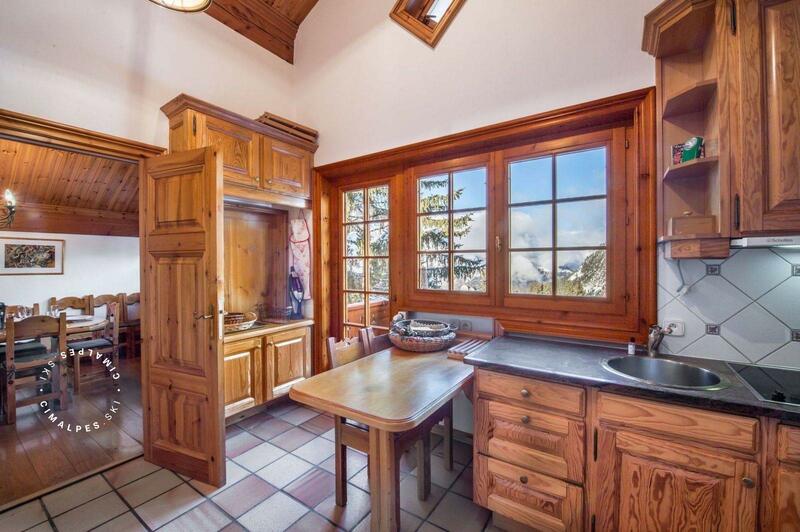 The authentic chalet Agathe Blanche is a ski-in / ski-out chalet of Courchevel Moriond. 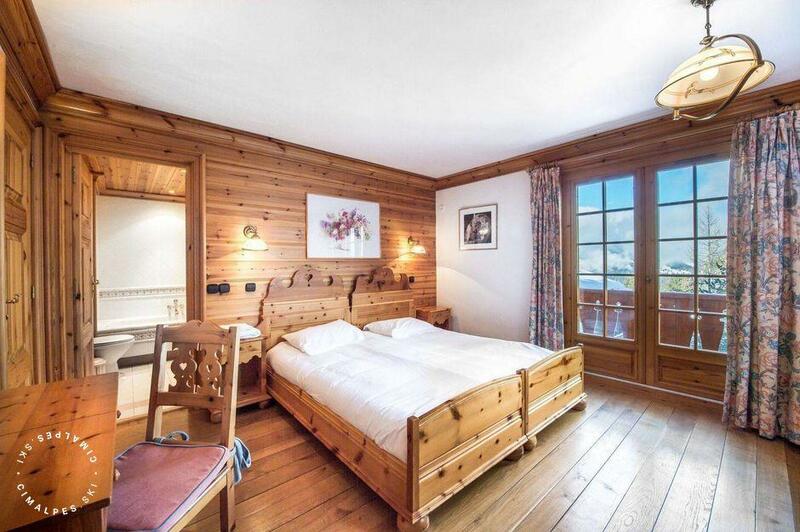 Its rustic decor, mountain ambiance, equipment and quality of service that the reputation Cimalpes has in the Alps will contribute to the success of your holiday. 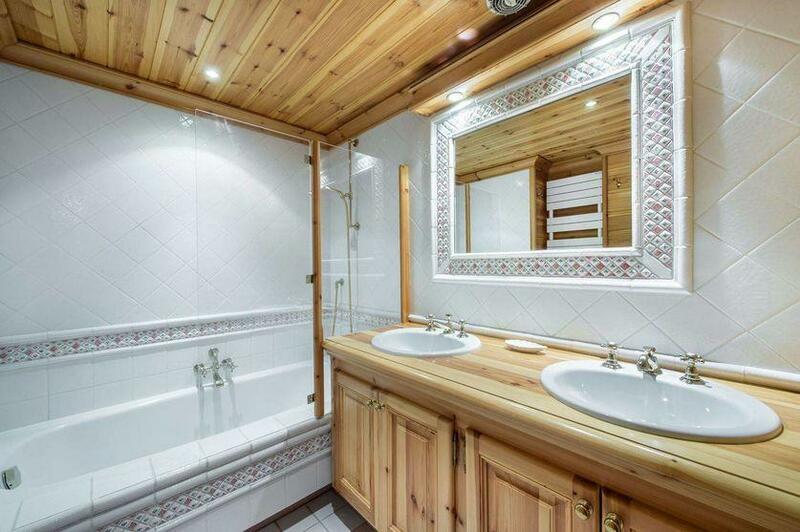 You will enjoy a relaxation area with sauna and balneo bath. 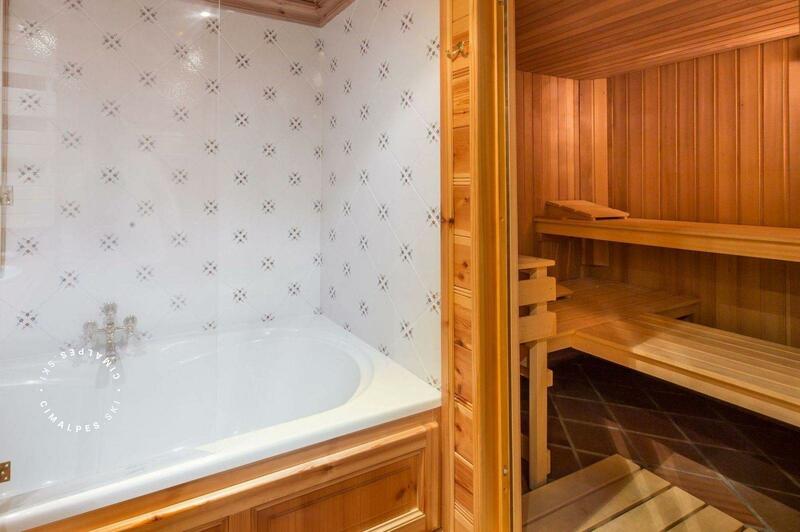 Leisure areas : You will enjoy a relaxation area with sauna and balneo bath. The chalet Agathe Blanche is a very nice ski in ski out chalet, close to the center of Courchevel Moriond. 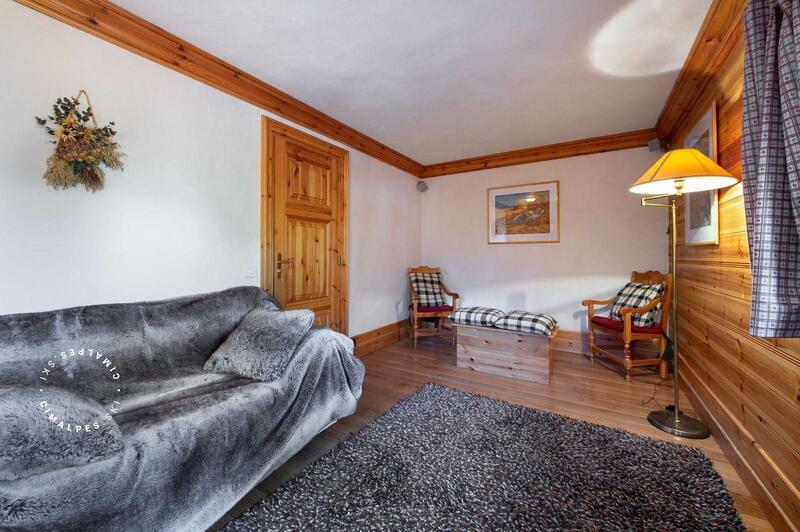 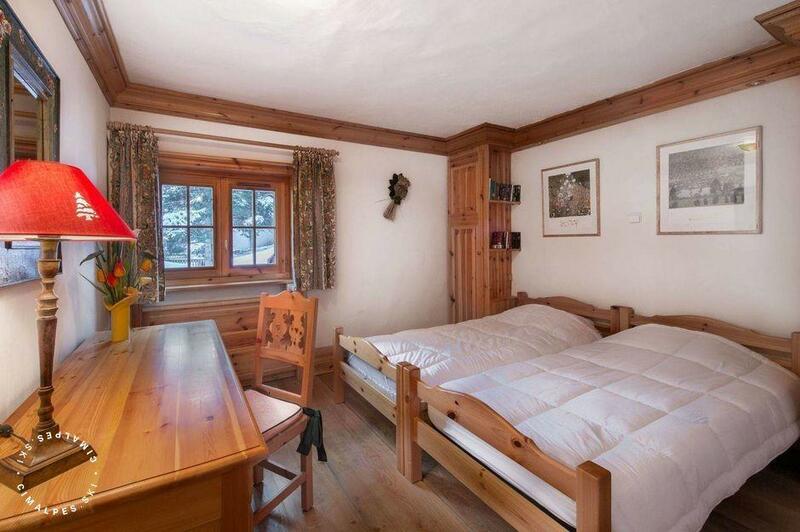 It is a very welcoming and comfortable chalet which is equipped for up to 12 people in 6 bedrooms.